“I thank KIR Foundation for this privilege, I have benefitted a lot from the Inclusive Young Leadership Academy, the program taught me about the importance of tolerance as a leader, because leaders get criticized and also applauded. Also, good leaders are visionaries and they inspire their followers to be greater than they are”. “I am really excited that I participated in this programme because it has taught me the difference between a leader and an effective leader. Also, leadership is not all about taking control but inspiring people, I am grateful for what KIR Foundation has done”. “I appreciate KIR Foundation for giving me the opportunity to be part of the YLA program, it has really brought out the best in me, and has taught me that being a leader without a goal is factious and the best form of leadership is servant leadership”. 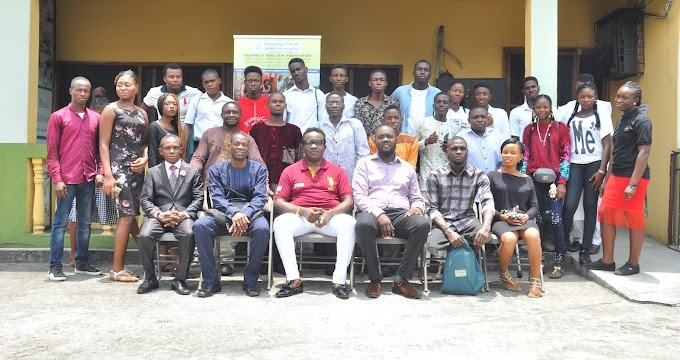 On the 23rd of May, KIR Foundation hosted the 5th Annual Inclusive Young Leadership Academy which was attended by 95 new elected or nominated secondary school prefects and 23 teachers from 23 public, private and inclusive secondary schools in Port-Harcourt Rivers State. The objective of the Inclusive YLA is to build the leadership capacity of the students and to motivate the teachers to become a positive influence in the lives of the emerging leaders. The one-day leadership workshop was facilitated by; Nancy Iheduru, Enoh Ogbevire, Esther Nweje, Victor Briggs, Roland Kenneth and Michael Diala made presentations on the following topics respectively Servant Leadership, Effective Communication, Etiquette, Influencing the Next Generation as a Leader, Social Media, SDGs and Global Citizenship. Also, the students were divided into four tribes; Yoruba, Zulu, Izon and Ashanti so that they could interact, network, collaborate and forge new relationships. A ‘Meet The Leader’ session was moderated by Mrs. Bitebo Gogo, the Executive Director of Keeping It Real (KIR) Foundation with Mr. Barine Gbosi; the Special Guest of Honour on his leadership journey. Thereafter, there was a question and answer session. The Inclusive YLA ended with an award ceremony for the winners of the essay competition. Nelson Simeon Nkiinebari of Community Secondary School, Nkpolu-Orowurokwo, Port-Harcourt emerged the winner. Emelle Christabel Onyinyechi of Immanuel International School was the First Runner Up and Nummue Promise Leka of Model Secondary School, GRA was the Second Runner Up. KIR Foundation appreciates Cinfores Limited, TND Press, ACCANigeria , Rotary GRA District 9140 Port - Harcourt, Red Chilli Catering services, Cobbs Engineering Limited, Denna Rossi, Rhythm 93.7 FM and Port Harcourt In Pictures, our facilitators, volunteers, interns and the entire KIR Foundation Team for supporting us to raise the next generation of servant leaders!